Morphogenesis can be considered as a self-organizing process shaped by natural evolution, in which two major adaptation mechanisms found in nature are involved, namely evolution and development. The main philosophy of morphogenetic robotics is to apply evolutionary developmental principles to robotics for designing self-organizing, self-reconfigurable, and self-repairable single- or multirobot systems. 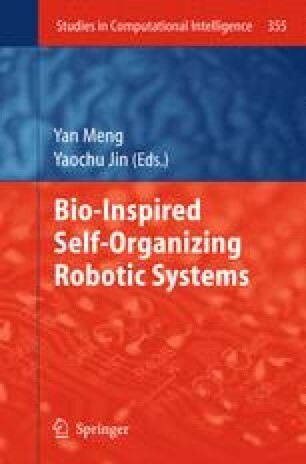 We categorize these methodologies into three areas, namely, morphogenetic swarm robotic systems, morphogenetic modular robots, and co-development of body and brain of robotic systems. In this chapter, we give a brief introduction to morphogenetic robotics. A few examples are also presented to illustrate how evolutionary developmental principles can be applied to swarm robots in changing environment. We also describe computational models for genetically driven neural and morphological development and activity-dependent neural development. As developmental mechanisms are often shaped by evolution both in nature and simulated systems, we suggest that evolutionary developmental robotics is a natural next step to follow.